15 months ago, Nickel Creek announced they were breaking up for an indefinite period after a year-long “farewell (for now) tour.” Tonight is the last stop on that tour. I’ll be there and will probably post some thoughts late tonight or in the morning. On the website, NPR.org/music, you can watch and listen to the recent Washington D.C. stop on the tour. I’ve long felt a bitter-sweet anticipation about this concert. This young group — they’re still very, very young — has bridged generations in my household. For different reasons, each person in my family is a fan of the individuals who make up the group, and the group itself. Lots of nostalgia. Here’s something to make some of you feel very old: It was 31 years ago (almost to the day) that the rock group known as The Band performed their last concert at the Winterland Ballroom in San Francisco. (Later, the group reformed and performed for several years without Robbie Robertson.) Martin Scorsese’s documentary of that concert, The Last Waltz, is considered (by some, at least) to be the greatest rock concert movie ever made. Coincidence? 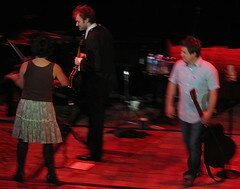 Nickel Creek recorded a song called First and Last Waltz on their album, Why Should the First Die?